Toshiba TEC B-EX4T2 printing solutions feature high quality and economical industrial products which deliver low running costs and total costs of ownership. Free your business from the constraints of legacy systems, simply plug and play with Toshiba B-EX4T2 industrial solutions. 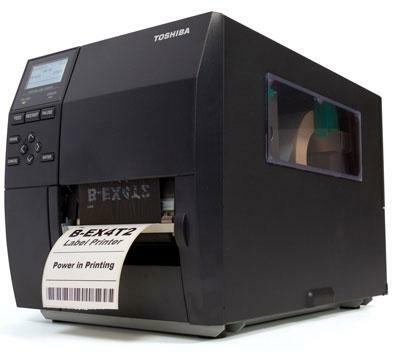 The Toshiba B-EX4T2 range of industrial label printers offer a cost effective label printing solution without compromising on the quality or features that you would expect from a world leading printer manufacturer. USB, LAN and Ethernet as standard, with a print width of 104mm at a maximum of 12 inches per second, the EX4T2 range offers you the ability to replace an existing install base of non Toshiba branded printers via an in-built Z-Mode emulation facility. The Toshiba B-EX4T2 printer delivers 'Carbon Zero' printing and has been awarded the Energy Star label. Ideally suited to all industrial label printing applications such as warehousing, retail labelling and transportation and logistics. Toshiba TEC B-EX4T2 - 200dpi Industrial Thermal transfer / direct thermal printer - Industrial Printer 4.0" wide, 200dpi Thermal Transfer / Direct Thermal, 32MB SD-Ram, 16MB Flash, Print Speed 12.0 ips, LAN / USB. Toshiba TEC B-EX4T2 - 300dpi Industrial Thermal transfer / direct thermal printer - Industrial Thermal transfer / Direct thermal 4.0" wide printer, 300dpi, 32MB SD-Ram, 16MB Flash, Print Speed 12 ips, LAN / USB. Toshiba TEC B-EX4T2 - 600dpi Industrial Thermal transfer / direct thermal printer - Industrial Thermal transfer / Direct Thermal 4.0" wide printer 600dpi, 32MB SD-Ram, 16MB Flash, Print Speed 12 ips, LAN / USB.